Happy Mean Girls Day – arts, ink. “On October 3rd he asked me what day it was” said Cady Heron from the hit 2004 movie Mean Girls. 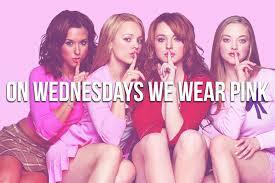 Ever since this movie has come out October 3rd is the official Mean Girls day. This year is more special in particular because October 3rd is a Wednesday, and even if someone hasn’t seen the movie it is a well known fact that “On Wednesdays we wear pink” – Karen a.k.a a plastic. Mean Girls has been a phenomenon since its release in 2004. It stars Rachel McAdams as the villain Regina George and Lindsay Lohan as the protagonist Cady Heron who just moved back to the United States from Africa with her parents. This movie is a classic teen movie because it shows some truth to high school while also exaggerating everything in the funniest possible way. Mean Girls quickly expanded by adding a much less popular sequel in 2011. This one starred Camp Rock star Meghan Martin. A Mean Girls musical was also created in 2017 and is now playing on Broadway. Mean Girls quotes became common knowledge after its release. Some of the most popular are when Regina George yelled to Cady “Get in loser, we’re going shopping”, when Regina George told the other plastics that she “wants to lose 3 lbs”, when Janis and Damon described Gretchen saying “Her hair is full of secrets”, and when Gretchen repeatedly tried to make “fetch” happen. It seems as though every other line of the movie is now a popular quote that most millennials know. The mastermind behind Mean Girls is Tina Fey. She wrote the movie and the musical. Fey was a writer on the tv show SNL and then she began to act on the series as well. She then went on to create and star in her own tv series separate from SNL called 30 Rock. Tina Fey has a famous friendship with Amy Poehler. The two of them were actors on SNL together and have starred in each others productions since then. They have become a famous dou by hosting award shows together as well. Poehler had a role in Mean Girls as the “cool mom” of Regina George.